a circular or rounded flat plate; often spelled disc in names of anatomic structures. articular disk a pad of fibrocartilage or dense fibrous tissue present in some synovial joints. Bowman's disk one of the flat plates making up a striated muscle fiber. embryonic disk (germ disk) (germinal disk) a flattened round bilaminar plate of cells in the blastocyst of a mammal, where the first traces of the embryo are seen; called also embryonic or germinal area. herniated disk see herniated disk. intervertebral disk the layer of fibrocartilage between the bodies of adjoining vertebrae; see also herniated disk. Merkel's d's small cup-shaped tactile receptors in the skin that are particularly sensitive to continuous pressure. optic disk the intraocular part of the optic nerve formed by fibers converging from the retina and appearing as a pink to white disk in the retina; there are no sensory receptors in the region and hence no response to stimuli. Called also blind spot. slipped disk popular term for herniated disk. 1. A round, flat plate; any approximately flat circular structure. 3. In dentistry, a circular piece of thin paper or other material, coated with an abrasive substance, used for cutting and polishing teeth and fillings. (disk) a circular or rounded flat plate. Spelled also disc. Bowman's disks flat, disklike plates making up striated muscle fibers. ciliary disk the thin part of the ciliary body. contained disk protrusion of a nucleus pulposus in which the anulus fibrosus remains intact. cupped disk a pathologically depressed optic disk. extruded disk herniation of the nucleus pulposus through the anulus fibrosus, with the nuclear material remaining attached to the intervertebral disk. gelatin disk a disk or lamella of gelatin variously medicated, used chiefly in eye diseases. herniated disk herniation of intervertebral disk; see under herniation. intervertebral disks layers of fibrocartilage between the bodies of adjacent vertebrae. intra-articular disks fibrous structures within the capsules of diarthrodial joints. noncontained disk herniation of the nucleus pulposus with rupture of the anulus fibrosus. optic disk the intraocular part of the optic nerve formed by fibers converging from the retina and appearing as a pink to white disk; because there are no sensory receptors in the region, it is not sensitive to stimuli. Placido's disk a disk marked with concentric circles, used in examining the cornea. protruded disk , ruptured disk herniation of intervertebral disk; see under herniation. sequestered disk a free fragment of the nucleus pulposus in the spinal canal outside of the anulus fibrosus and no longer attached to the intervertebral disk. slipped disk popular term for herniation of an intervertebral disk; see under herniation. 1. A round, flattened structure in a plant or animal, such as an intervertebral disk. 2. Botany The central area bearing numerous disk flowers in the flower head of a composite plant such as a daisy. 1 a flat, circular platelike structure, such as an articular disk or an optic disc. Also spelled disc. 3 media used to store data in a computerized format. 2. dentistry A circular piece of thin paper or other material, coated with an abrasive substance, used for cutting and polishing teeth and fillings. 3. microbiology A plate coated with an antibiotic to measure susceptibility and resistance. 4. The optic nerve head as viewed during ophthalmoscopy. The biconcave oval disk of fibrous connective tissue that separates the two joint cavities of the temporomandibular joint on each side. A thin circular paper (or other substance) used to abrade, cut, or polish teeth or dental appliances. An oval disk of cells in the blastocyst of a mammal from which the embryo proper develops. Its lower layer, the endoderm, forms the roof of the yolk sac. Its upper layer, the ectoderm, forms the floor of the amniotic cavity. The primitive streak develops on the upper surface of the disk. See: embryo for illus. A disk of cartilage at the junction of the diaphysis and epiphyses of growing long bones. Cartilage synthesis provides for growth in length; eventually the cartilage is replaced by bone. See: Hensen, Christian Andreas Victor. A modification of the cell membrane of adjacent cardiac muscle cells; it consists of extensive folds and intercellular junctions for electrical and mechanical linkage of contiguous cells. The fibrocartilaginous tissue between the vertebral bodies. The outer portion is the anulus fibrosus; the inner portion is the nucleus pulposus. The disk is a shock absorber, or cushion, and permits movement. 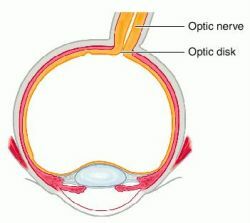 The area of the retina where the optic nerve enters. Colloquial term for herniated disk. A thin, dark disk that transversely bisects the I band (isotropic band) of a striated muscle fiber. The thin filaments, made primarily of actin, are attached to the Z disk; the area between the two Z disks is a sarcomere, the unit of contraction. that part of the receptacle surrounding the plant ovary which is fleshy and sometimes nectar-secreting. A ringlike structure that fits between the vertebrae in the spine to protect the bones, nerves, and blood vessels. The outer layer is a tough, fibrous tissue, and the inner core is composed of more elastic tissue. dentistry a circular piece of thin paper or other material, coated with an abrasive substance, used for cutting and polishing teeth and fillings. n a thin, flat, circular object. n a disk with abrasive particles attached to one or both of its surfaces or its edge. n a disk of steel with diamond chips bonded to its surface. n a disk with particles of garnet as the abrading medium. n.pr the brand name for a separating disk. See also disk, separating. n a steel separating disk. n a set of circular magnetic surfaces mounted coaxially on a shaft for computer storage of files. Can be used for storage of serial or direct access files. n a disk with an extremely fine abrasive; used to finish and polish a surface. n a separating disk with abrasive on one side only; the other side is smooth. n an abrasive disk with sandpaper as the abrading medium. n a disk of steel or hard rubber. n a storage device that uses magnetic recording on flat, rotating disks. a circular or rounded flat plate. See also intervertebral disk. a pad of fibrocartilage or dense fibrous tissue present in some synovial joints. As specialized intra-articular structures they differ from articular plates in that they have nerve and blood supplies. a flattish area in a cleaved ovum in which the first traces of the embryo are seen. Called also germinal disk. the lesion produced by a sudden extrusion of non-degenerate nucleus pulposus from intervertebral disks into the cervical vertebral canal as a result of trauma. the embryo in a hen egg. these develop on the ventrolateral aspects of the head early in fetal development. They deepen, are surrounded by the developing nasal processes, then break through into the oral cavity and become the nasal cavities. the popular name for prolapse of the nucleus of an intervertebral disk. Q. What alternatives are there for DDD.De generative Disc Disease? I can't sit upright for long periods of time, at times the symptoms are worse and then days and weeks where I feel fine. When I lean into my right legit alleviates it a little but it is excruciating when I shift weight. I also have to sleep with a pillow between my legs and have to shift frequently.I have a lot of strength in my legs and back. But if I stuck in my stomach more and curve my like doing a crunch. the pain is fine. A. Degenerative disc disease can often be successfully treated without surgery. One or a combination of treatments such as Physical therapy, chiropractic manipulative therapy (CMT), osteopathic manipulation, anti-inflammatory medications such as nonsteroidal anti-inflammatory drugs, chiropractic treatments, Traction (orthopedics), or spinal injections often provide adequate relief of these troubling symptoms. The option of surgery may be recommended if the conservative treatment options do not provide relief within 2 to 3 months. If leg or back pain limits normal activity, if there is weakness or numbness in the legs, if it is difficult to walk or stand, or if medication or physical therapy are ineffective, surgery may be necessary. You should dicucss this with an orthopedic surgeon. 7GB discs in less than 9 minutes) are readily available and are already aggressively priced. Also notable was new software to analyze the interaction of material, mold, and machine to yield the highest disc quality in the shortest cycle time. Prentice Hall Information Network--PHINet (Prentice Hall, $2,500 for one of the four discs or $7,500 for all four discs including semiannual updates) PHINet CD-ROMs have been available since 1986. Like DVD-RW, the disc must be erased before rewritten and thus for video applications, it cannot be modified after it is "closed," but it is being aimed at the purchaser who requires both data storage and home video playback with the ability to use it in both DVD-ROM drives and DVD players. This machine ejects the discs during the 8-mm mold-opening stroke. The DASCOR Disc Arthroplasty System has been in clinical use outside of the U. 6GB DVD-RAM disc was accepted as a removable data storage device, the new 4. A dual-layer SD manufacturing line will have two presses that feed into a single line that metalizes both discs, then puts a back-coating on each and bonds them together. The company's advanced material science played a key role in enabling the development of 200GB blue laser disc technology. We are even able to maintain the 3-sec cycle with CD-ROM discs that are well within Yellow Book specifications," Keating says, referring to the technical standard developed by Philips of the Netherlands. What's next for CD molding? Although fusions relieve back pain, they may significantly limit range of motion and place extra stress on discs above and below the fusion site.